Welcome to the web page of the Deniliquin Genealogy Society Inc.
We have a large collection of records for the Deniliquin area, including records for all Australian states and many overseas countries. 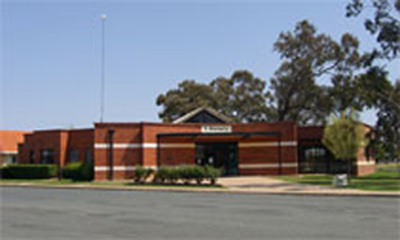 The Society is situated at the library located in Napier Street Deniliquin. General Inquiries can be made by emailing the address above or by mail to P.O. Box 144 Deniliquin NSW 2710. Membership fees are $5 Joining Fee and $25 annual fee, Discounts are made for students and pensioners. Contact the society for further details. Our rooms are open every Friday 10.30 am - 4 pm and other times by appointment. To avoid disapointment please contact the Society in case changes to these times have been made. We are not open on Public Holidays or from the 3rd Friday in December until the 3rd Friday in January. Appointments are possible during this time if the library is open. For questions in regard to family history research please write or email using the research form link below. This service costs $20 per hour for an initial research $20 plus $2.50 for postage. Members who live over 50km from Deniliquin are given up to two hours free research per financial year. Deniliquin Family History Group Inc. The Deniliquin Family History Group Incorporated, it's members either individually or collectively, cannot be liable for any error or omission in this publication or for damages arising from its supply, performance or use, and make no warranty of any kind, either expressed or implied in relation to this publication. Every care has been taken to ensure the information is accurate, and persons acting on information do so at their own risk.